Located in downtown Kyoto, this restaurant has been here for 30 years. They offer a southern Indian curry originated in Kerala where Ayurveda was born. You may be glad that curry in "Kerala" is made of many kinds of vegetables and has a lighter taste. As vegetarian curry and halal meat are available here, various guests who have different cultural backgrounds frequently come visit. One of the most interesting points about this restaurant is that they offer 40 kinds of curries. Family with children and those using wheelchairs are welcomed as there is an elevator to this restaurant. Very authentic and fine Indian curry lunch- a tandoori chicken is our favorite which is nicely seasoned with yogurt, salt and turmeric, and has a sour and spicy taste. Soup would be served first and it has a mild and creamy tomato flavor. 2 kinds of curries of the day are usually one with meat and one with vegetables. They are slightly spicy but it would be nice to eat with yogurt which makes curries milder. This is the best lunch set for vegetarian guests- their veg-curry is great for those who love vegetable curries! Today's specials were 1) broccoli and bamboo sprout and 2) mushrooom and eggplant. Chewy naan goes well with these vegetable curries as they both have light taste. This lassi has a rich yogurt taste and you may enjoy drinking it both with curry and as a dessert. 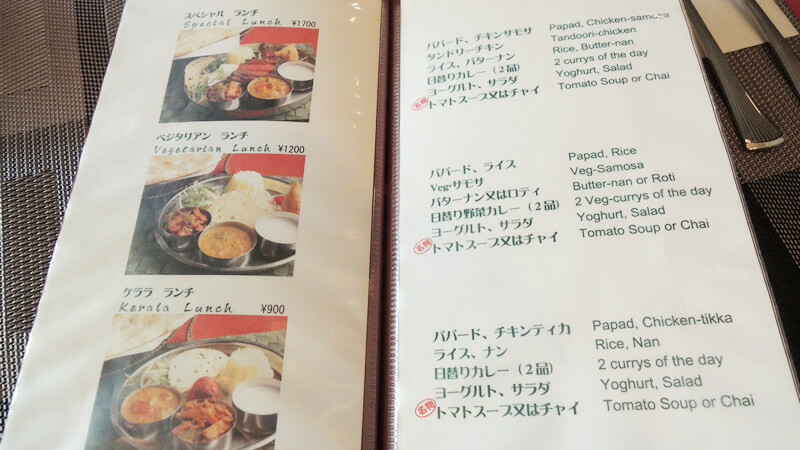 English menu is available and staff who can speak English are at the restaurant usually during the business hours. Veg-samosa is served with ketchup but we recommend that you try put one of the curry sources which makes this samosa even more flavorful. If you still have a room for more curry, you can have one more cup of curry by adding ￥100. You can have another bowl of rice for free. For the lunch set, you can choose either tomato soup or chai tea. I enjoyed the light taste of vegetable curries in this restaurant. You may feel relaxed and enjoy the atmosphere as you listen to an Indian music. Family with children and single guests are both welcomed as there are many seats available. Although you can taste some spices in the curries, they are not so spicy. You may be amazed by the volume of the lunch set! I recommend that you go there when you're hungry. Please have a look around the interior ornaments in the restaurant. It would be crowded around 12p.m. As there is an elevator to the restaurant, those who bring baby carriage and wheelchair are easily accessible.